I’ve gotten quite a few visits to my blog from people searching for information on the Monument Valley Pathway. There really isn’t much info online (pretty evident when my blog is the second hit in Google). I figure I’ll do a public service and post some info about the path, and update it as necessary. Please comment if something needs to be updated/added/corrected! 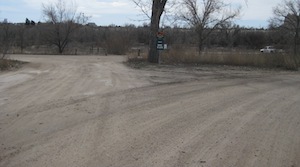 To get to my starting point, enter the driveway for Riverside Zoo on Highway 71/Beltline Highway and follow the green signs for the dog park, which will take you back towards the riverbank. You’ll reach a split in the road. To get to the dirt parking lot I’m using as my first reference point (where the white pickup truck is in the photo below), go right and take an immediate left. 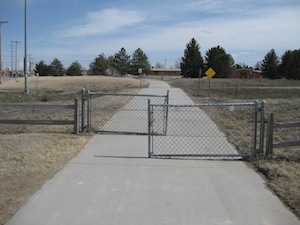 This is a dead-end segment of path. 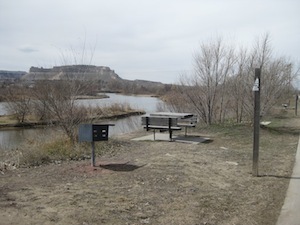 The only reasons to traverse it are to add mileage to your outing, to use a picnic table, or to birdwatch. 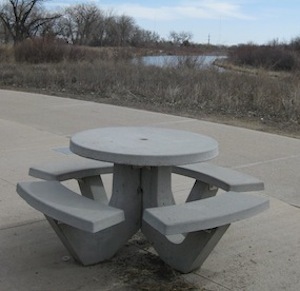 I marked the picnic tables I saw with Xs on the map. 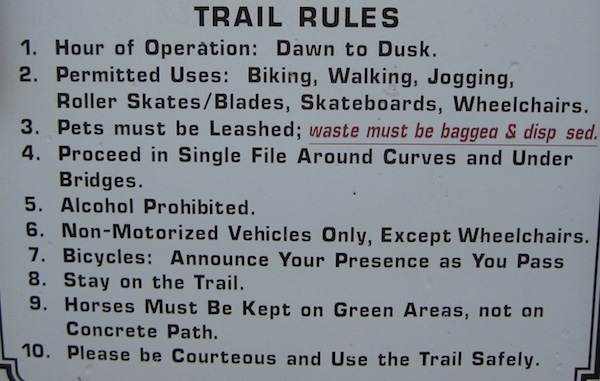 The two in the west can be reached by walking on dirt paths not on the official trail system. 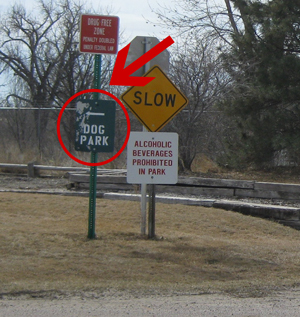 The beginning of the disc golf course is marked with a target, and there’s also a playground to the north/northeast of the disc golf icon. 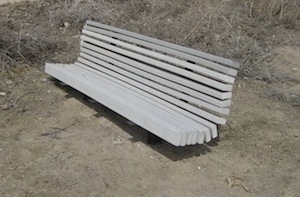 Some benches are very nice. 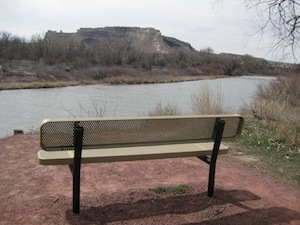 Some benches are absurdly short. 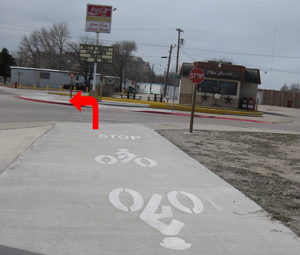 Note that when eastbound on this segment of path, you will encounter a split: going right will take you on Segment#4 under Broadway/10th Street to the YMCA; going left will take you to Rotary Plaza or to Segment #5 and over the North Platte River. This is another dead-end spur, but there’s lots of parking at the YMCA, and bathrooms and drinking fountains are also available. This segment of path is non-ADA-compliant because of the steepness of the slope under the bridge, so slow down if you’re on wheels. There also tends to be icky graffiti problems under the bridge. This part of the pathway is a little convoluted but is still easy to follow. Go over the North Platte River. 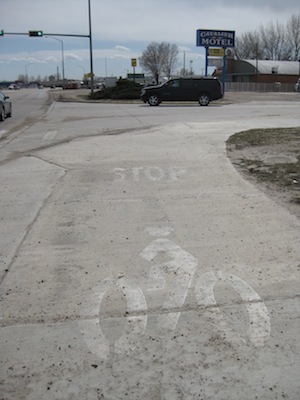 If you’re on a bike, walk it across, for two reasons. One, the path is very narrow. Two, it can get very windy up on the bridge, and the guardrails are not all that tall. Be alert: you must cross Terry Boulevard and a business driveway and there’s loose gravel on the pavement. If you have kids on bicycles with you, I recommend that they walk their bikes along here. Turn right at Twin City Drive. 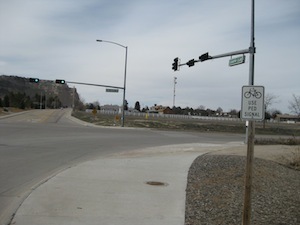 Pass to the south of The Roost, enter the mobile home park, and turn south at the crosswalk. Be alert for traffic! 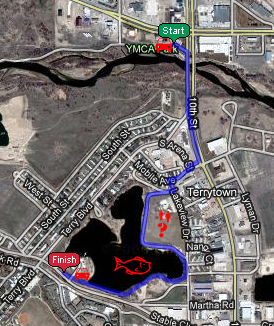 Go around Terry’s Lake. There are benches and playgrounds and picnic tables (and I think bathrooms?) here. 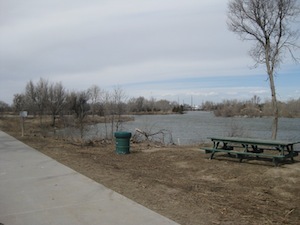 Terry’s Lake is also apparently a prime fishing spot. 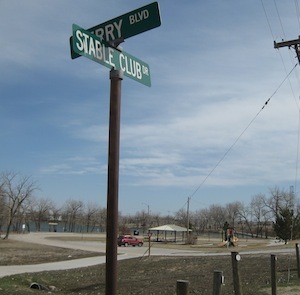 There’s a parking area, sheltered picnic area, and playground at the corner of Terry Boulevard and Stable Club Road; the parking entrance is on Stable Club Road. Go southwest on Terry Boulevard, carefully crossing Stable Club Road, and turn southeast on the sidewalk past a maintenance building. 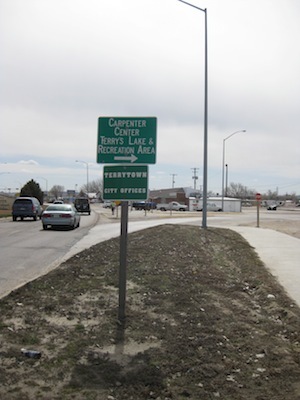 Circle around the baseball diamonds to the Carpenter Center (bathrooms and water available), then turn southeast and proceed along the railroad track to Country Club Road. On Country Club Road, the bike pathway is in the street (with one exception). There are marked bike lanes on both sides of the road, and parking is prohibited. 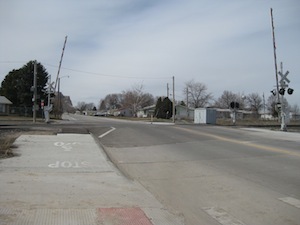 Caution is required in two places: when crossing the Union Pacific railroad tracks and when crossing busy Five Rocks Road/21st Street. At the traffic light at Five Rocks Road, the bike lane hops up onto the sidewalk (bikers, please beware of pedestrians). Note: Country Club Road westbound is uphill and usually against the (often substantial) wind. 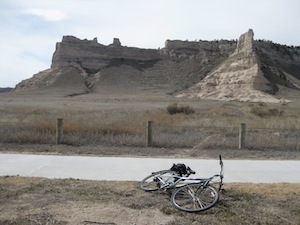 This is a segment of trail with beautiful views of Scotts Bluff National Monument and the city of Gering. At the southern end of this segment, the path splits. 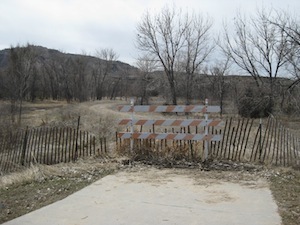 To the west, the path enters Park Service territory, and users are subject to an entry fee. 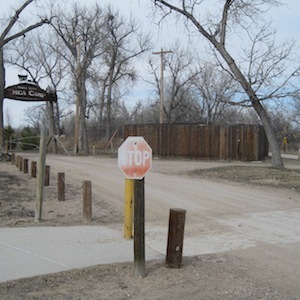 The 1.2-mile path leads to the Visitors Center and to the start of the 1.6-mile Saddle Rock Trail (which is too steep for wheels). 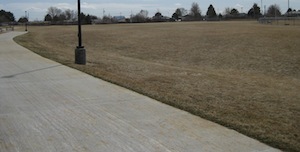 To the east, the path merges into the U Street Pathway, the final segment of the Monument Valley Pathway. 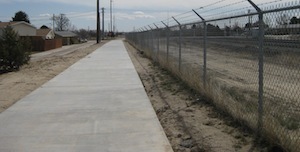 There is a small dirt parking lot near the southern end of this segment. A good portion of this pathway is downhill and with the prevailing wind; make sure your bike brakes are in working order. 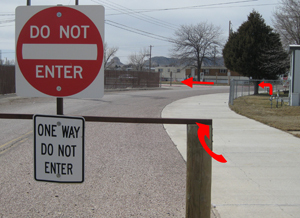 The pathway crosses the entrance to the Gering “bale facility”, so watch out for truck traffic. 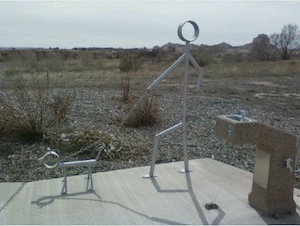 There is a water fountain on the path, but it may not be turned on, depending on the season. You must cross Five Rocks Road again, but this time, there is no traffic light — take care! The pathway switches to the north side of U Street and undulates among several street and driveway crossings (again, take care!) before ending in an odd loop at 13th Street. 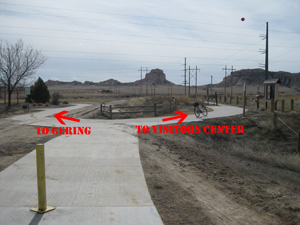 If you want a map of the whole trail, the Scottsbluff/Gering United Chamber of Commerce has a 2009 street map online that shows the pathway with brown, double-dashed lines. You can also get a copy of the map from tourist information kiosks around the area (and at many downtown businesses). It’s obvious to me that you spent a lot of time and effort on this! Great job! Thank you for your thoughtful site. 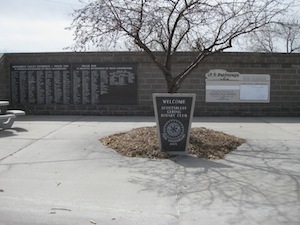 I was in town for business and enjoyed a round at the frisbee golf course, thanks to your directions and pictures. I was also treated to a beautiful view. I’m so glad this was of help to you, Beth! I would like to update this post at some point and put up some better pictures. You’re very welcome! I’m thinking I need to do an update on this post with different formatting and different pictures. Thanks so much for all your work. We are headed that way and are always looking for bike paths. This was so helpful in our planning. Glad this was helpful to you! I’m somewhat embarassed by that post. It’s one of my earliest ones, before I figured out photo formatting. I’d like to redo it, but so many people find it a useful resource, since there really is no other online guide to the pathway.